This was posted on August 3, 2015 by Sarah Maxwell. 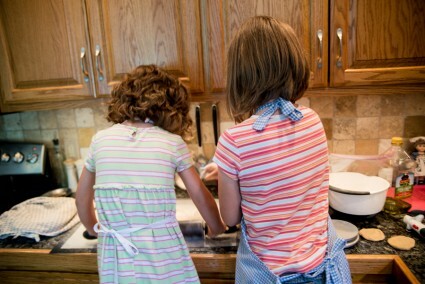 Often on Sundays, I have two helpers for making tortillas. 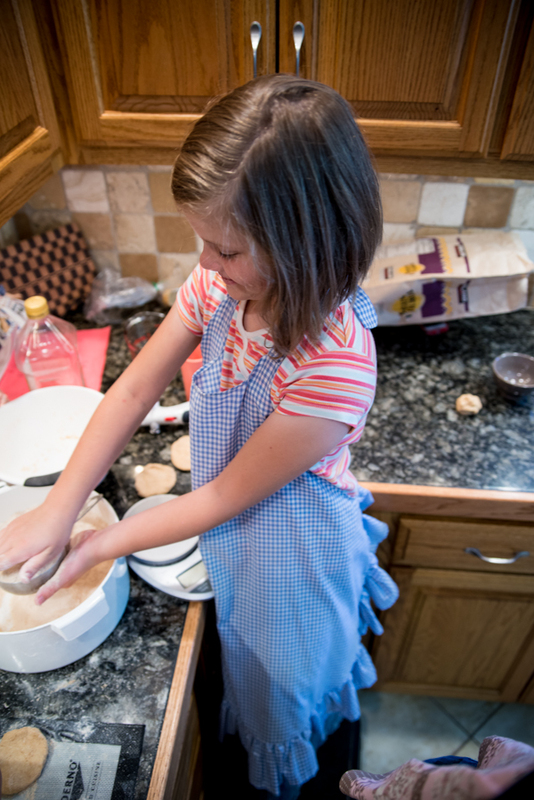 Abigail weighs out the dough into 1 1/2 ounce balls. She’s extremely good at it, too. Then, Bethany fashions it into beautiful balls for me to roll out. At the end of our process, I try to have enough for the girls to each make 3 tortillas. The girls are awesome help! This is the really sweet part. 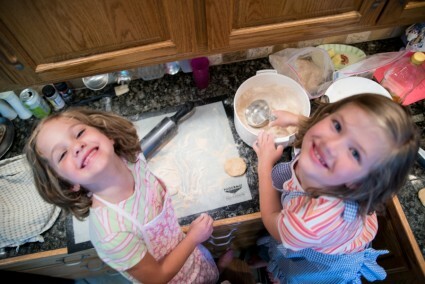 They choose who they’re going to make theirs for, and they work so hard at rolling the dough balls out to get them big. 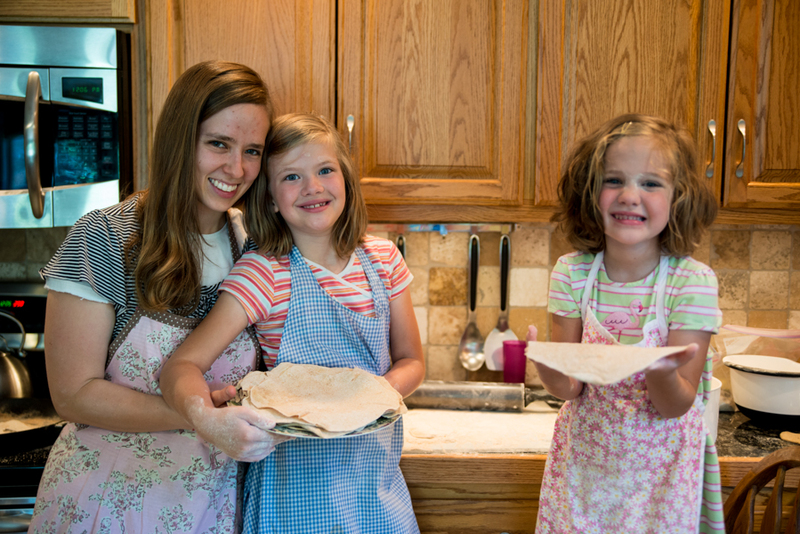 Even at 7 and 4, Abby and Bethany can make large, round tortillas! I don’t help. This is their opportunity to do however they’d like. Which has prompted me: how often do we think a little kid can’t do something, but we haven’t let them try? Or, sometimes they might need a bit of instruction at first and then they blossom. All it took with this was to coach the girls how to roll them and how to push hard. I checked the blog archives, and it seems to have been awhile since I posted our tortilla recipe, and I’ve modified it since, so I’ll post it here. Mix flour and salt together while melting butter. Stir in melted butter. Add water until dough is soft. 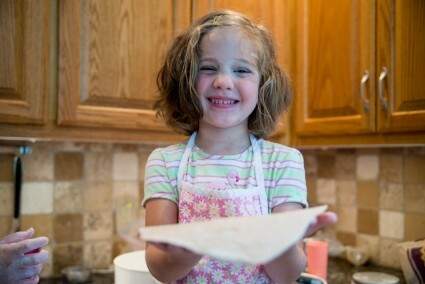 If you have thick dough, it’ll be extremely difficult to roll out, and if it’s too soft, your dough will break and tortillas with holes aren’t pretty! Portion dough into balls. I like 1 1/2 ounce balls. 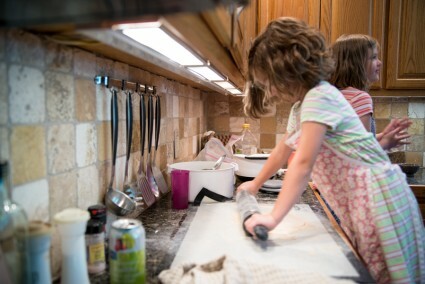 Using a well-floured surface, roll out. Cook in a dry skillet lightly on each side. (I generally put the skillet on the stove and let it heat up before I begin to cook.) Stack on a plate and cover with a towel. Enjoy! First Day of School Disaster or Success? Way to go. 😉 Teaching someone to drive is an experience! Sounds delicious! Do you mix the dough by hand, or do you use a food processor or some sort of mixer? Do you have to make them fresh each time, or have you found they keep well for a while in the fridge or freezer? Yes, by hand. It’s not hard. I do make them fresh. They definitely lose freshness, but we store the leftovers in the refrigerator. You can heat them up in a skillet later or the microwave. Thanks for sharing your recipe. Looks like you have some great helpers there! Looks like some good tortilla helpers! That looks like fun. 🙂 Nothing like being rewarded for your labors by being able to eat what you made! Pretty soon, the girls will be doing it all on their own. I know. Bethany’s hair is so pretty! People were definitely surprised to find out that my 2-year-old daughter made my morning coffee. I didn’t let her pour the hot coffee, but she measured and poured the cold water in, added the filter and grounds and turned the machine on for me after she was done her breakfast. This was her ‘special job’ and NOT a task she would even consider letting her older brother do (smile). I was able to have a steaming cup as we headed out the door. A perfect task for a 2-year-old to feel like a special helper, yet if there were morning troubles, I could skip the coffee and we could still get out the door on time.